GE U30C Locomotive mod for Transport Fever. The U30C was one of the first successes of General Electric in the diesel locomotive market. 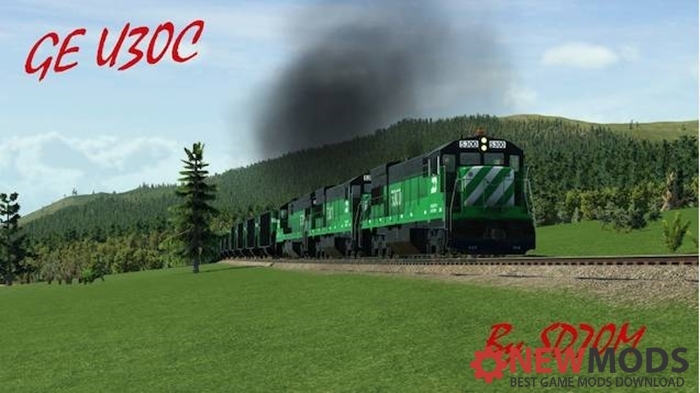 With 600 units sold, the U30C proved to be a viable alternative for customers who could not purchase SD40 or SD40-2 locomotives from EMD due to production backlogs. As the U30C hit the market, rail companies began to understand the benefits of high horsepower six-axle locomotives. This meant that the model was able to hold its own well in the market despite reliability problems. A total of 606 locomotives of this type were manufactured for 18 Class 1 railway companies, the US Department of Transportation and the Mexican Ferrocarril del Pacifico until the end of production in 1976. Please contact me, if you want to use files of this modification.